Smartphone interfaces are fast becoming a common sight as even the entry-level hatchbacks of today boast of Apple CarPlay and Android Auto integration. Apart from mirroring the phone, these interfaces also benefit from the digital assistants like Siri and Google Assistant. But for older cars that do not have such interfaces, or cars with integrated audio units that cannot be replaced with newer aftermarket solutions with as much ease as the previous decade, CarPlay or Android Auto becomes a tough interface to integrate. Amazon seems to have realised the opportunity and is able to make the most of it, thanks to its discreet integration that doesn't necessarily need a display. At the CES, Amazon displayed as many as ten devices that benefit from this architecture. While there are the usual suspects like in-dash audio units, the more interesting ones are plug and play devices. 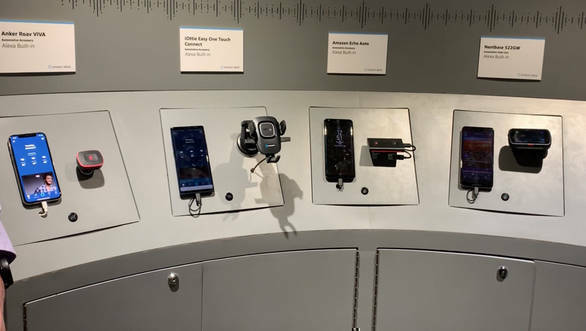 These include a tiny device that fits into the 12V socket; Amazon's own USB powered device that sits atop the dashboard; and even a wireless-charging cradle that integrates Alexa Auto. All these devices are constantly listening for the user's commands and pair with the phone for internet connectivity. In terms of integration in the car's infotainment system, the discrete functionality of Alexa lets it work independently of any chosen smartphone interface. So in theory, you could summon the services of the Siri/Google or Alexa assistants on the same infotainment system with their respective call signs, without having to unpair any devices. Carmakers are increasingly adpoting this technology in their cars by way of the Alexa Auto software development kit that lets them integrate and personalise the service with their integrated infotainment systems. At the 2019 CES, Amazon also demonstrated how you could order usual groceries, shop of items in your Amazon basket, ask Alexa to lock the doors or turn off the lights in your house, or even control compatible devices in the kitchen (like brewing a hot cup of coffee in time for your arrival) - while on the move and without having to take your eyes off the road. Apple and Google too have similar services, the Alexa just seems to be at the forefront and its seamless and easy integration only makes it a stronger choice.